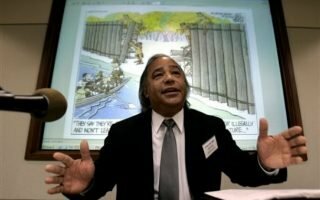 Stephen Adkins, VFH Board Member and Chief of the Chickahominy Indian Tribe, presenting at NMAI on the differing experiences of European-Native contact. Photo by Katherine Fogden, National Museum of the American Indian. 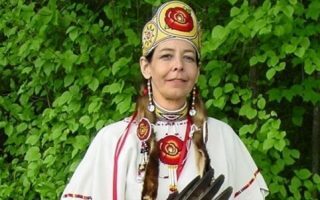 VFH Board member Stephen Adkins served on the school board for Charles City County where he became aware of a void in the way the story of Virginia Indians was told in Virginia history classrooms. A father and his three children pose for photographer William Bradshaw at the Chickahominy Reservation in Charles City County in 1969. Courtesy of Valentine Richmond History Center. 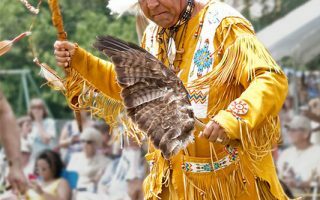 Encyclopedia Virginia has recently published an entry on Indians in Virginia that provides a concise and authoritative summary that doesn’t exist anywhere else on the web. 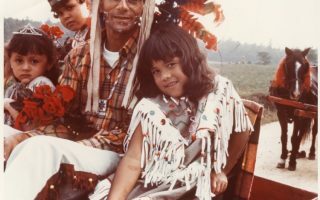 The Virginia Indian Archive makes historic photographs, documents, and oral histories available to students, researchers, and the public not just in Virginia but throughout the world. 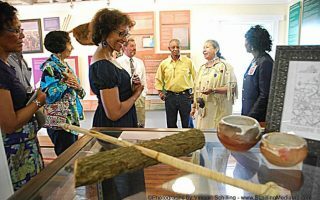 Exhibit exploring Nottoway of Virginia Indian Life, from pre-Jamestown to the present day was supported with a recent VFH grant to the Virginia Nottoway Indian Circle & Square Foundation. 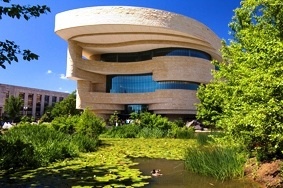 When it first opened in 2004, the National Museum of the American Indian promised to usher in a new understanding between Indian and settler cultures in the U.S. Yet, the public response has been mixed. VFH Fellow Monika Siebert examines why that is. 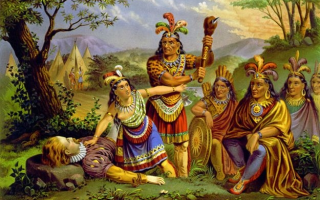 Mythologized version of Pocahontas saving John Smith. Based on the engraving “Smith Rescued by Pocahontas,” by Christian Inger, 1870, Virginia Historical Society. Stories are made of silences. What the writers of stories—of history—believe to matter becomes the narrative, and what they think doesn’t matter is excluded.